The ‘slot’ corner position used to be an afterthought in football about a decade ago. As we detailed last week about slot receivers, offenses are now using the slot to attack defenses on a regular basis. This has led to the slot defender becoming not just an important position, but many defensive coordinators now view them as a starter on defense. With that in mind, here are the top 10 highest-graded slot defenders through the first half of the college football season. 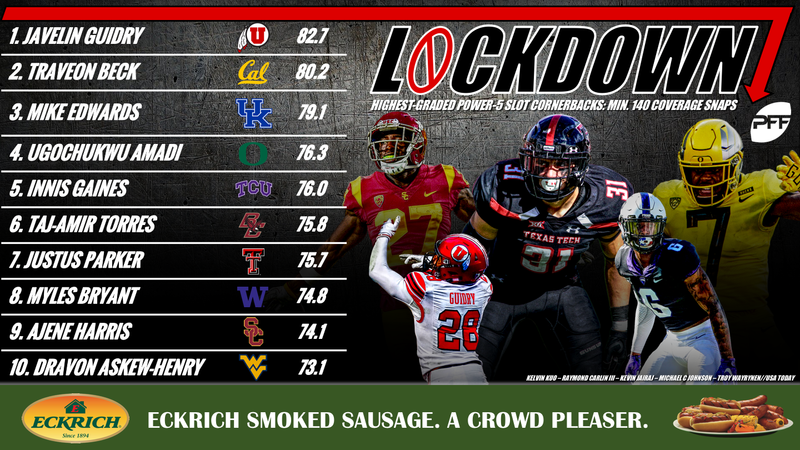 This list of 10 highest-graded slot defenders is brought to you by Eckrich, the Official Smoked Sausage of the College Football Playoff. To the point in the open about slot defenders gaining importance, West Virginia deploys senior Askew-Henry entirely in the slot and he’s currently their second-highest graded cornerback the season. Askew-Henry has allowed only 114 yards on 10 receptions in the pass-happy Big 12. He has limited receivers in the slot to the tune of allowing just one reception every 12.2 snaps. Harris has had a bit of an up and down year so far, much like the Trojans. His worst game of the season came in a loss to Texas yet, he bounced back nicely after that and played his best game of the year against Colorado and Lavikska Shenault Jr, who is the highest-graded receiver this year. Harris allowed two receptions to Shenault on four targets and had a pick-six on a tipped ball. The junior is a leader in the secondary that can play lights out in the right situation. In the Huskies win over Utah, Bryant allowed only one reception, which was for nine yards on 3rd & 25 and currently this season, he’s only allowing a reception every 9.2 snaps in coverage. As an added bonus, Byrant is great in the run game with an overall grade of 79.7 on the season. Parker’s raw numbers can be deceiving as most of the yards and every touchdown he’s given up this season came in two games against Ole Miss and Houston in Weeks 1 and 3, respectively, where he surrendered five receptions for 122 yards and a touchdown. Outside of those two games, he’s allowed just six receptions for 64 yards and no touchdowns while dominating in Big 12 play. Torres has seen more targets than anyone else on this list, yet despite that, he’s only allowed 23 receptions. His two worst games of the season came against NC State and Jakobi Meyers, who made our top 10 slot receiver list and his lone touchdown against him came against Purdue and Rondale Moore, who is rocketing up the true freshmen rankings. Despite logging so many snaps in coverage and playing against excellent receivers, Torres is still only giving up 1.2 yards per coverage snap. Gaines has lined up primarily over slot receivers (228 out of 329 snaps) but has as lined up all across the TCU defensive front. In slot coverage specifically, he is allowing a ridiculous 0.39 yards per coverage snap and he’s snagged an interception and only allowed nine receptions in six games for 48 yards. Prior to allowing a season-high three catches for 19 yards (yes, those are season-highs), he had allowed 29 yards in the previous five games and sports a passer rating of 40.2 when targeted. Teams have targeted Amadi 36 times this year from the slot and he’s given up a reception on just 52.7% of those targets, the best percentage among the top 10. He also leads the list with three interceptions from the slot to go with an outstanding 53.5 passer rating when targeted. Despite being targeted so much, Amadi has given up only two touchdowns on the season and has only given up a passer rating of over 80.0 on one occasion this season. While some players on this list may excel in one area or another, Edwards has put up consistent numbers in nearly every metric in slot defense. He has the fourth-best passer rating when targeted at 61.0 and is allowing a reception once every 10 snaps. He has not allowed a touchdown and is one of the more versatile players in the top 10 as he’s played 100 snaps at free safety as well. The Pac 12 takes the crown for ‘land of the slot corner’ with five defenders on this list and three of the top five. Beck has allowed just 76 yards from the slot in seven games this season. In what could be called his ‘worst outing’ to date, Beck allowed a mere three receptions for 28 yards to Oregon’s standout quarterback Justin Herbert. The Utes have climbed to the top of the Pac 12 South largely on the back of their defense. Guidry is a sticky cover man as he has been targeted the fourth most of any player in the top 10 on a per-snap basis. The sophomore has risen to the occasion, with a 65.8 passer rating when targeted this season, and he’s only getting better. He posted his two best overall coverage grades the past two weeks in wins over USC and Arizona.